Thiruvananthapuram, August 18: Heavy and incessant rains have lashed Kerala. The death toll has risen to 324 due to overflowing of rivers which have wreaked havoc in the state. A fresh red alert was sounded in 11 of the 14 districts in Kerala by the India Meteorological Department (IMD). The weather department has warned of "heavy to heavy rainfalls" in the next 24 hours. Half of Kerala’s landscape is currently flooded with water. However, in this grievous situation water has receded in one the bridges of the state. A large amount of plastic and other wastes have been thrown back by the flooded water on the bridge. Former Chief Election Commissioner of India SY Quraishi has tweeted about this incident. In his tweet, he wrote, “One of the bridges in Kerala after the flood receded. 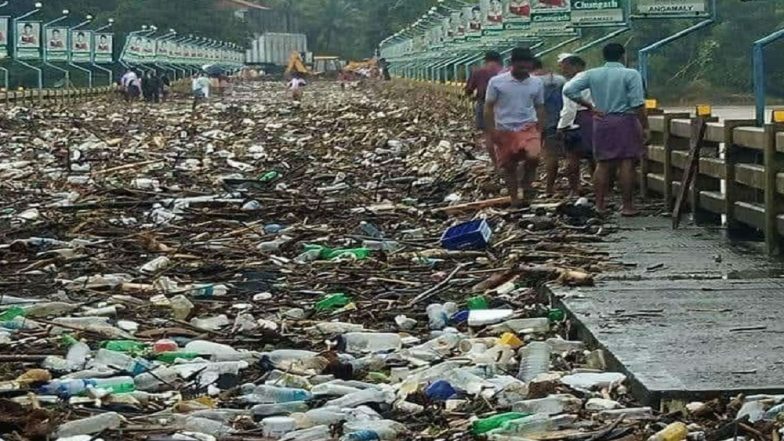 As someone remarked ‘our gifts to nature returned with thanks!’ "
A similar type of incident had occurred in Mumbai in July, the sea level rose during the high tide, above the Marine Drive promenade and splashed the seawater along with the garbage. Kiran Dighavkar, the assistant municipal commissioner, shared the before and after pictures of the promenade. Around 30 BrihanMumbai Municipal Corporation (BMC) workers cleaned the entire promenade. On Saturday, Prime Minister Narendra Modi undertook an aerial survey of the state. He also announced an immediate aid of Rs 500 crore from the Centre. Support has also poured in from other states, whose governments have pledged donations for Kerala floods. Chief Minister Pinarayi Vijayan, The situation is grave and dangerous. We appeal with folded hands to the entire nation to help in all manner they can. The total losses that we have incurred could be estimated to Rs 10,000 crore.” Kochi airport has been closed till August 26 due to floods.